Congressman Bishop, as well as Representatives Lewis, Scott, and Johnson, are members of the Congressional Black Caucus (CBC), which has highlighted issues of environmental justice. The Environmental Protection Agency defines environmental justice as, “the fair treatment and meaningful involvement of all people regardless of race, color, national origin, or income with respect to the development, implementation, and enforcement of environmental laws, regulations, and policies.” Among the CBC’s initiatives on this issue are health disparities and the environment, the impact of Hurricane Katrina on minority communities, and opposing the location of a dangerous plastics plant in a poor, black community in Louisiana. We are writing to express our concerns regarding Sabal Trail Transmission, LLC’s (“Sabal Trail”) application for a certificate of public convenience and necessity to construct a 516-mile-long, 36-inch-diameter natural gas pipeline through Alabama, Georgia, and Florida. If approved, approximately 160 miles of the pipeline would traverse nine counties in southwest Georgia, five of which are located in Georgia’s Second Congressional District represented by Congressman Sanford Bishop. We are especially concerned about the proposed location of the pipeline and an accompanying compressor station in Albany, Georgia, which is located in Dougherty County. The proposed location raises serious environmental justice issues that have not been fully addressed by FERC in its Draft Environmental Impact Statement (DEIS) for the project. The population of Dougherty County and the City of Albany is approximately 72% African-American. The median household income is only $28,871 for a family of four. Approximately 32% of the population lives below the poverty line. The unemployment rate also is higher than the state average. In the southern part of Dougherty County, the communities are overburdened by pollution with 259 hazardous waste facilities, 78 facilities producing and releasing air pollutants, 20 facilities releasing toxic pollutants, and 16 facilities releasing pollutants into the waters of the United States. Cancer rates and cancer-related deaths are higher in southwest Georgia than in the rest of the state. Sabal Trail’s proposed pipeline and compressor station will further burden an already overburdened and disadvantaged African-American community in this area. Sabal Trail’s proposed route will go through Albany and Dougherty County and will run through low-income African-American neighborhoods. The proposed industrial compressor station facility would sit right in the middle of an African-American residential neighborhood comprised of two large subdivisions, a mobile home park, schools, recreational facilities, and the 5,000-plus member Mount Zion Baptist Church, a predominantly African-American congregation. The statement in FERC’s DEIS that the compressor station would not be located in an environmental justice community is not correct. 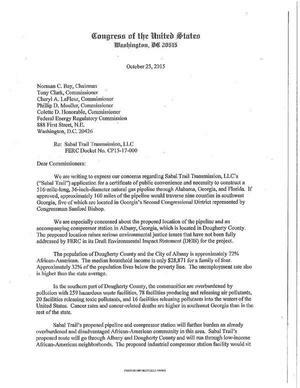 In fact, FERC acknowledges in its DEIS that 71% of environmental justice populations would be affected by the Sabal Trail Project and that the percentage of environmental justice populations in Doughtery County is 85% (see DEIS at p. 3-217). The compressor station would occupy several acres, have a height of six stories, and have two 21,000 horsepower turbines running 24 hours a day every day of the week. It would be lit up all night long, emit thousands of tons of pollutants into the air each year, and constitute a non-stop source of noise and vibration. The undisputed evidence in the record shows that this massive compressor station would emit so much pollution that it would further contribute to the City of Albany exceeding the National Ambient Air Quality Standards under the federal Clean Air Act for nitrogen oxides. In addition, studies have documented that noise pollution causes adverse health effects including vibro-acoustic disease, hypertension, heart disease, hearing impairment, communication problems, sleep disturbance, and adverse cognitive effects including memory loss and behavioral problems. The nitrogen oxides and volatile organic chemicals that the compressor station would emit are known to harm respiratory, cardiological, neurological, and kidney functions as well as cause premature death. Even small levels of nitrogen oxides can cause nausea, irritation of the eyes and nasal passages, fluid in the lungs, and shortness of breath. The area already has among the highest incidences of stroke, heart disease, diabetes, cancer, and obesity. 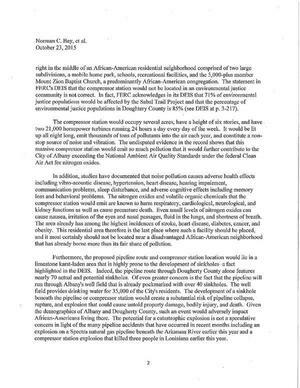 This residential area therefore is the last place where such a facility should be placed, and it most certainly should not be located near a disadvantaged African-American neighborhood that has already borne more than its fair share of pollution. Furthermore, the proposed pipeline route and compressor station location would lie in a limestone karst-laden area that is highly prone to the development of sinkholes — a fact highlighted in the DEIS. Indeed, the pipeline route through Dougherty County alone features nearly 70 actual and potential sinkholes. Of even greater concern is the fact that the pipeline will run through Albany’s well field that is already pockmarked with over 40 sinkholes. The well field provides drinking water for 35,000 of the City’s residents. The development of a sinkhole beneath the pipeline or compressor station would create a substantial risk of pipeline collapse, rupture, and explosion that could cause untold property damage, bodily injury, and death. Given the demographics of Albany and Dougherty County, such an event would adversely impact African-Americans living there. The potential for a catastrophic explosion is not a speculative concern in light of the many pipeline accidents that have occurred in recent months including an explosion on a Spectra natural gas pipeline beneath the Arkansas River earlier this year and a compressor station explosion that killed three people in Louisiana earlier this year. As you may be aware, 18 C.F.R. § 380.15 requires that any compressor station be located in an ‘unobtrusive location.’ It is clear to us that placing Sabal Trail’s proposed compressor station in the heart of an African-American residential neighborhood hardly qualifies as an unobtrusive location. Moreover, in accordance with Presidential Executive Order 12,898 (“Federal Actions to Address Environmental Justice in Minority Populations and Low-Income Populations”), FERC is obligated to address environmental justice issues that may be raised by Sabal Trail’s proposed pipeline project with respect to minority and low-income communities (Exec. Order No. 12,898, 59 Fed. Reg. 7629 (Feb. 11, 1994)). Proper application of that Order mandates moving the proposed pipeline route and compressor station location. Apart from the above legal considerations, common sense would suggest that a pipeline carrying a highly flammable substance and a massive polluting industrial facility should not be placed in any residential community, much less an environmental justice community. It should be more evident when the underlying karst geology creates a significant risk of substantial harm and when other alternative routes and locations exist. It would be reasonable to slightly alter the route of the pipeline outside the largest urban area in southwest Georgia and to move the compressor station to a more rural location given that much of the surrounding area is comprised of agricultural land. Surely this modification can be done for a pipeline that would run for 160 miles through southwest Georgia. It is essential that FERC require Sabal Trail to abandon its proposed pipeline route and compressor station location and to propose alternatives that will not adversely impact environmental justice communities in southwest Georgia. We would greatly appreciate your attention to this matter and would request a prompt written response. To view a scan of the letter, please click here. Congressman Bishop has written two letters to the FERC — in November 2014 and May 2015 — raising serious concerns about the route of the pipeline through Southwest Georgia, the use of eminent domain, the location of the compressor station near Albany, and whether the citizens of the Second Congressional District actually will stand to benefit. Earlier this month, he wrote to the U.S. Army Corps of Engineers about Sabal Trail’s application for a Section 404 permit under the Clean Water Act which is needed to encroach upon numerous “waters of the U.S.” Bishop successfully urged the Corps to extend the public comment period for the Section 404 permit by two months until December 11, 2015. To view the entire U.S. Army Corps of Engineers public notice regarding the Sabal Pipeline project, please click here. To view the joint public notice of extension, please click here. To read the FERC Environmental Impact Statement, please click here. Congressman Sanford D. Bishop, Jr. is serving his twelfth term in the U.S. House of Representatives, representing Middle and Southwest Georgia’s 2nd Congressional District. A leader among the fiscally responsible Democrats in Congress, Congressman Bishop has served on the House Committee on Appropriations since 2003 and is the Ranking Member on the Military Construction and Veterans Affairs Appropriations Subcommittee. Congressman Bishop also serves as the Co-Chair of the Congressional Military Families Caucus, Congressional Peanut Caucus, and the Congressional Chicken Caucus. For more information, feel free to visit Congressman Bishop’s website or social media platforms. To receive e-newsletter updates from Congressman Bishop, please click here. 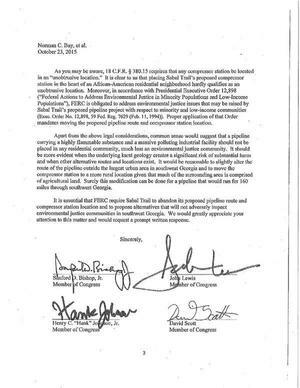 Here are Sanford Bishop’s first (“extend the comment period”) and second (“I believe that FERC should deny STT’s application for a Certificate of Public Necessity”) letters to FERC. The judge in WWALS v. Sabal Trail & FDEP may be able to say “concerns” don’t matter, but concerns of sitting U.S. Congress Members sent to an agency that claims to be “Federal” do matter. Four Members of Congress just stood up. You can, too! I am in an RV park in Wildwood, FL. Sabal is finishing up their work now, within view of my trailer. Yesterday was the worst day of my coughing and congestion and I realized my symptoms started when they began work here. Two other people complained about it too. Perhaps my information will support the health issues of air quality, of lung and sinus pollution caused by Sabal’s work. And what is in the dirt dust they are excavating? It seems the people are powerless against corporations.